You have seen the black towers rise. You have glimpsed the tattered mantle. He is coming! He is coming! Gather your cult and bring forth Carcosa – home to the King in Yellow! With His gifts and the right stars, you can bring it here. 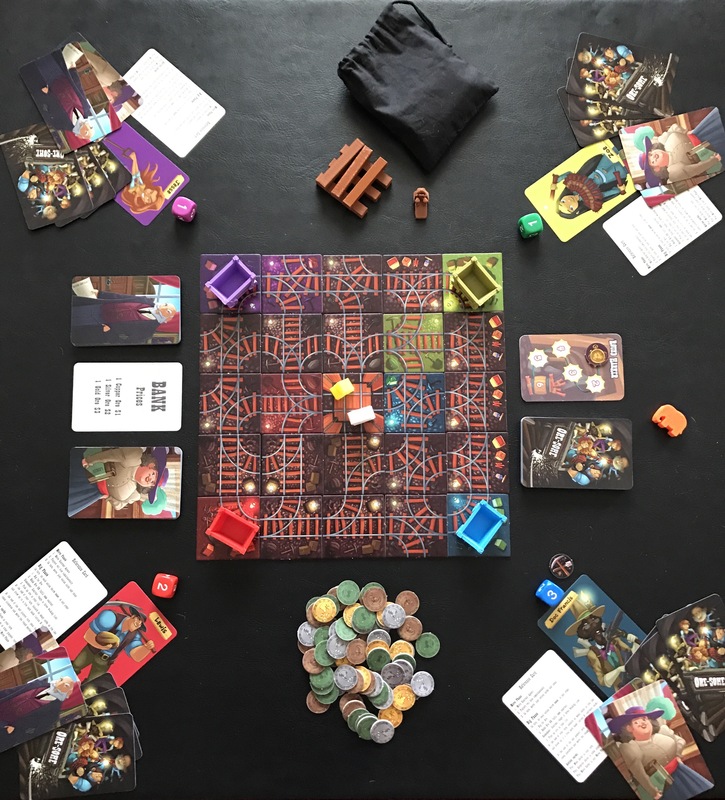 In Carcosa – from designer Nigel Kennington and published by One Free Elephant – you will summon the city of the Tattered King, one tile at a time! You will use your cultists to tap leylines, conduct rituals, and explore the districts of Carcosa itself. If your cultists displease you, you can sacrifice them to the dark waters of Lake Hali for the pleasure of the King. Only the most devious leader will be able marshal his cult through The Coming of Carcosa and earn the right to wear the Pallid Mask! 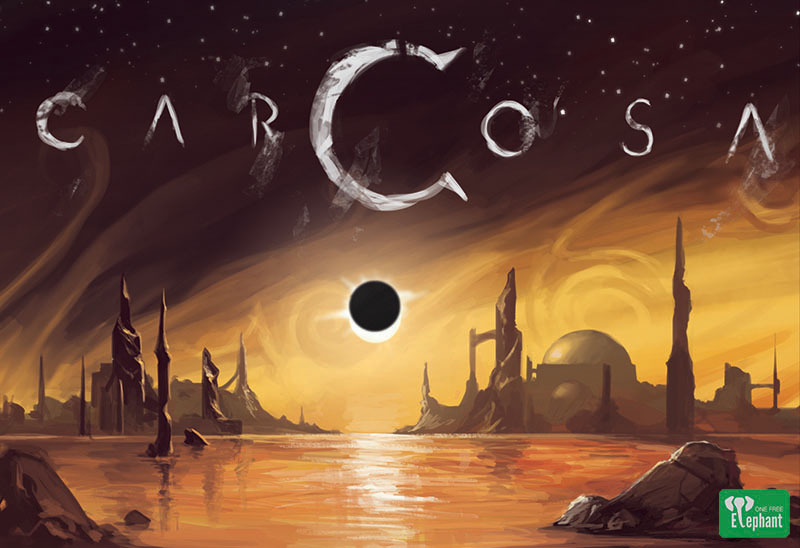 Carcosa is a tile placement game for 2-4 players ages 14 and up that plays in 45-60 minutes. Players will take turns placing tiles to build the city of Carcosa and utilizing their cultists to lay claim to parts of the city and gain power from the various landmarks throughout in order to stabilize your tiles and cast game-changing spells. One cultist standing up in the center of the Yellow Sign (on the cult mat). This is the Prophet. One cultist standing up next to the Occult Power Track on the cult mat. This is the Oracle. Three cultists lying down in the center of the Yellow Sign. These are cultists who could potentially be recruited. 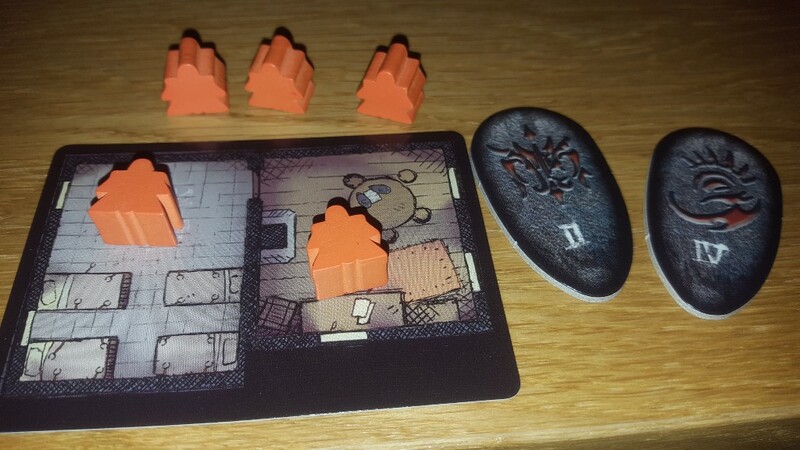 One cultist lying down in the Asylum area of the Chapter House card. This cultist begins the game insane, but will recover over time. One cultist standing up in the Recovery Room area of the Chapter House card. This cultist has recovered from insanity, but is not yet stable enough to be trusted. Determine a first player in a way that would please the king (maybe the last person to dream of the stars or wear a mask). Starting with the first player, and proceeding clockwise around the table, players will take the following actions. Recover sanity – move any cultists in the Recovery Room to the ready pool. Then move any cultists in the Asylum to the Recovery Room. Select a tile – A tile must be taken from an unoccupied stack on the Yellow Sign. Place your Prophet on top of the stack from which the tile was taken. Tiles may not be taken from a stack that has a Prophet on top of it. Place or replace a tile – The active player may look at both sides of the tile, but must place the tile once they’ve looked at it. They do not have to show the tile to anyone else. The tile is then placed, unstable side up, to continue the landscape. The placed tile must share a side with at least one other tile and all leylines, districts, and water must connect. The new tile can also replace an already placed tile, as long as it does not break any placement rules. The replaced tile is placed at the bottom of the stack with the fewest tiles. Place a cultist – The active player may place one cultist from their ready on the tile they just placed. Placing a cultist will not only keep that tile from being replaced by another player, but can also generate power for your cult. Resolve tile – Each placed tile may cause various effects, from gaining power to devouring unfortunate cultists. Tiles will become stabilized based on their type. Leylines will stabilize when they are connecting two confluxes and/or ritual sites. Ritual sites become stable once they are completely surrounded by other tiles. Districts stabilize when all they are completed (meaning the wall around the district is complete and unbroken). NOTE: At any time during a player’s turn, that player may trigger an effect from any imbued ritual stones they may have. The ritual stones have various effects that can switch up the gameplay. Players can use ritual stones to do things such as return insane cultists to their ready pool, examine tiles in a particular stack on the cult mat, and return a Prophet to their ready pool until the next time they select a tile. The game ends immediately when either two stacks of tiles are completely depleted (A Cult Ascends) or one cult summons the King in Yellow (The King Rises). Each open leyline controlled is worth one power per tile. Each incomplete ritual site is worth one power per adjacent tile. Each incomplete district controlled is worth one power per tile. Each sacrifice not devoured is worth one power. Each imbued ritual stone that has not been used is worth one power. After final scoring, the cult with the most power takes control of Carcosa and may wear the Pallid Mask (i.e. they win!). When an Oracle reaches the end of the power track, they cannot gain or lose power and must conduct the Summoning Ritual. From this point, whenever a cultist from that cult is driven mad, instead of sending them to their Asylum, they are placed standing up on the Yellow Sign. If a single cult manages to get three cultists standing up on the Yellow Sign (before two tile stacks are depleted), they have completed the ritual and the King in Yellow comes forth to survey his new domain! Carcosa is an absolutely solid game. It takes Carcassonne and adds some new mechanics that increase the depth of strategy involved with placing tiles. The decision to not randomize the tiles by pulling them from a bag and instead give players multiple tiles to select from really adds a new level of planning to the game. 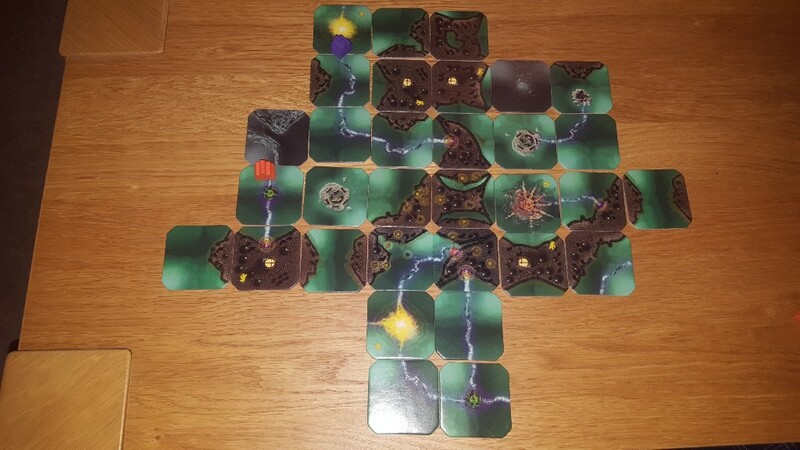 Players must decide which tile will benefit them the most, while not leaving openings for their opponents to grab tiles that will benefit them. The theme is handled very well and doesn’t feel even remotely pasted on. Cultists go insane when performing rituals or other tasks to summon the King in Yellow, and require time to recover before they can be used again. This makes thematic sense. Tapping into leylines to gain power in order to perform occult spells also fits the theme. Since Carcosa is based around the familiar mechanics of Carcassonne – tile placement, meeple/cultist assignments, and different types of tiles – it is incredibly easy to learn. A player need only learn a few extra rules and they can dive right into the game. I also found that the game plays very well at all player counts. It scales incredibly well, and the play time does not suffer from a higher (or lower) player count. Today, I am excited to introduce a new feature to the pages of The Chubby Meeple – designer interviews! In this first installment, I talk with Brent Critchfield from Studio Woe. We talk about the history of the company, as well as his current Kickstarter project, Gruff: Rage of the Trolls. So, without any further ado or fanfare, let’s dive right in! Q: So, Brent … what’s the story behind Studio Woe? Brent: Studio Woe is a venture started by my wife Virginia Critchfield and myself with the mission statement of “Creating Catastrophic Levels of Amazement”. Our objective is to create things that are so cool that they will leave a swathe of devastation in their wake. We are primarily known for making a series of card games called “Gruff”, but we are also a contract art house that provides services for both board games and video games. Q: When did you first start designing games? Was Gruff your first game? Brent: Gruff was the first game I ever self-published, but I had been working in the games industry for 12 years on various video game projects, including League of Legends and Darksiders 2. Gruff has been a labor of love for me going back almost a decade at this point. It has been really satisfying to make it publicly available and find that there is an audience of people that appreciate this crazy world. Q: Tell us about Gruff. Brent: Gruff is about the aftermath of the events of the story “The 3 Billy-Goats Gruff”. After the goats defeated that troll, their shepherds realized the destructive potential of goats. They engaged in a weaponized goat arms-race that drove the trolls to the brink of extinction. It is a tactical card game where you get to build a custom herd of mutated monster goats and then try to crush your friends with them! Q: I know there was a second installment of Gruff called Clash of the Battle Goats. What did this second installment change or add to the base game? Brent: Clash of the Battle Goats was all about trying to make a more accessible version of Gruff. It is designed to be easy to learn with enough content for 2 players to play right out of the box, but without an overwhelming amount of options that might be a barrier to a first-time player. It also adds recommended starting cards that make deck building faster and easier. Q: Gruff: Rage of the Trolls is on Kickstarter now. What does Rise of Trolls change or add to the base game? Brent: In the newest Gruff game, the trolls have returned and their rage will shake the foundations of the Universe! “Gruff: Rage of the Trolls” augments the world of Gruff with new co-op and single-player boss battles! It also includes enough new goats and shepherds to play the core competitive game right out of the box! Q: What would you say to someone looking at the Rage of the Trolls Kickstarter who was concerned about never having played a Gruff game before? Brent: “Gruff: Rage of the Trolls” is a great place to get into the world of Gruff because the co-op and single-player modes mean that it is easier than ever to find someone to play with! If competitive 2 player games are more your speed, the game includes everything you need to start challenging your friends. It has 6 new goats and 5 new shepherds with new mechanics that unlock new and exciting decks! Q: When does the Kickstarter end? Brent: Tuesday June 28th at 11:59pm. We are down to our final hours! Q: How has it gone so far for you? Brent: The response from Gruff players has been tremendous! We hit our initial funding goal in just 8 hours, and immediately got “Staff Picked” by the awesome folks at Kickstarter. The thing that is even more exciting to me is the amount of engagement we have seen from players. A lot of fan fiction, fan art, and fan poetry has been created by gruff players. I love to see that type of involvement! Q: Will there be future games in the Gruff universe? 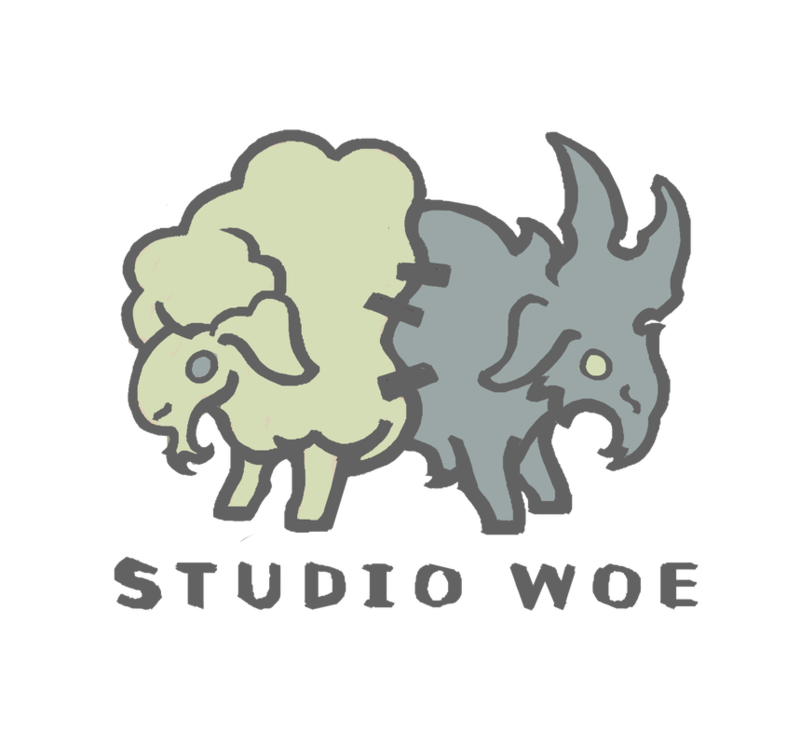 What’s next for Studio Woe? Brent: Absolutely! Our next Gruff project is called “Gruff: Stuff of Nightmares” where we will introduce a new faction of plushy nightmare goats! Additionally, the next project that is coming down the line is a dexterity game called “Pirate Tanks of Skull Island”. Brent: Everywhere! But our primary communication channel is our Facebook page. But you can also find us on Twitter, our website, Reddit, and our wiki. Q: Additional Thought/Comments (anything else you’d like people to know)? Brent: Gruff is a tactical combat card game where players duel to the death with custom teams of mutated monster goats! 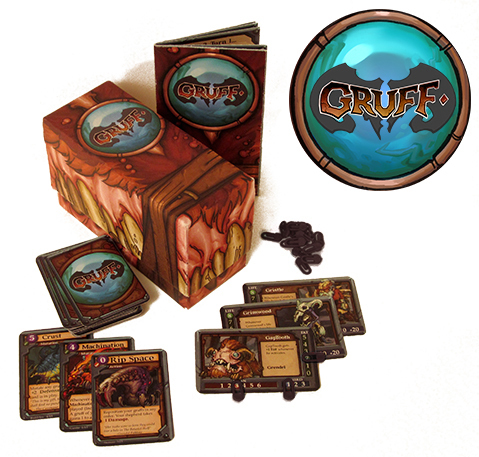 Gruff features unique positional and timing mechanics that create a constant state of attack and counter-play. Gruff: Rage of the Trolls adds a new dimension to the game, troll Boss-Fights. Each troll is a challenging puzzle that players will take on individually, or with a friend in a co-op mode! Rage is a stand-alone Gruff-Compatible game which means that players can take on these trolls using just the contents of this box, or by adding cards from other Gruff games! 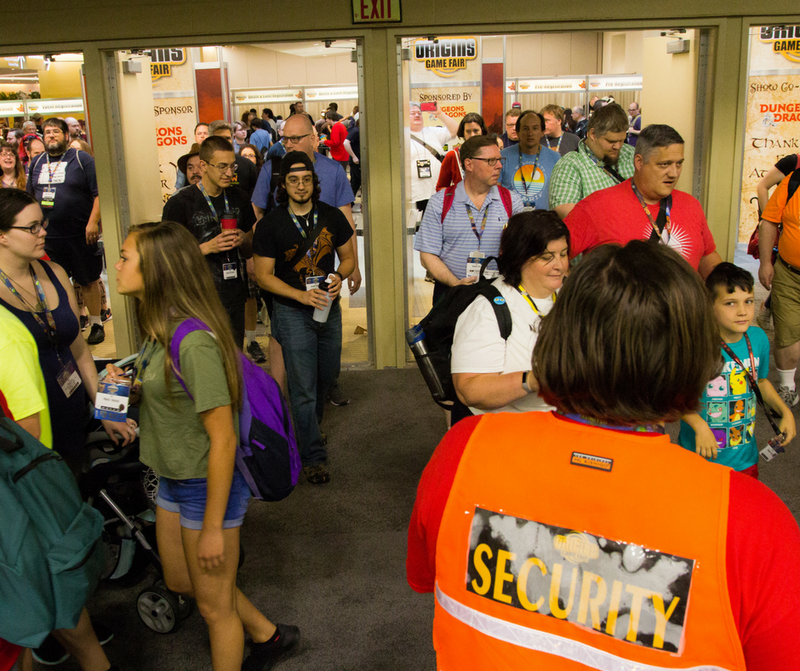 Columbus, OH – Origins Game Fair welcomed thousands of guests from all over the world to the Greater Columbus Convention Center, June 14-18. This annual convention brings in gaming companies, authors, artists, and more for five days of events and family fun. 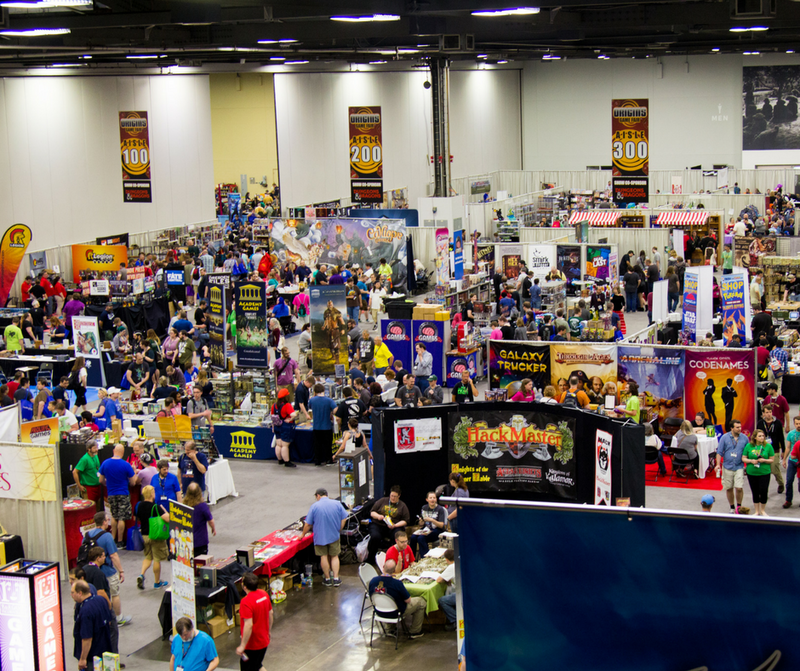 Origins 2017 featured over 7,000 events, a 24 percent increase in events from 2016. The show offered major tournament play, with the return of the WizKids World Championships, national tournaments for IELLO, Catan Studios, Konami, and the Catalysts Battletech Open. Other events included role-playing adventures with show co-sponsors Dungeons & Dragons, live comedy shows, a costume contest with cash prizes, and new this year; True Dungeon—a live-action, walkthrough dungeon experience. Attendance hit a record high this year. Unique badges rose nearly 10 percent, from 15,480 in 2016 to 17,001 in 2017. Turnstile attendance increased just over 12 percent, with a count of 52,561 in 2016 to 58,958 in 2017—showing an upsurge in attendees returning to the show each day. Origins continues to see growth while maintaining it’s relaxed, family-friendly vibe. Every year, the show expands its range in entertainment, offering events varying from fandoms to award ceremonies. It’s a convention that is welcoming, personable, and takes pride in its inclusivity. Origins Game Fair 2018 is scheduled to be held June 13-17 at the Greater Columbus Convention Center. Hotel blocks with group rates will open for reservations at the beginning of September 2017. Learn more about Origins at www.originsgamesfair.com. Origins Game Fair is one of North America’s most prominent annual gaming conventions. It is run by The Game Manufacturers Association (GAMA). Origins serves the gaming industry in general, including miniatures gaming, board games, trading card games, LARPS, and role-playing games. Helgarten, a once quiet port town, has become the industrial hub of a vast empire. Ramshackle towers and factories blight the skyline, and a sick canopy of pipes and chains hangs over the cobbled streets. With the growth and expansion of the city has come a seedy underbelly – every day, pirates and smugglers import vicious creatures and fantastical beasts from across the globe, hidden among barrels of grain and sugar cane. These creatures are destined for the Helgarten pits. In abandoned sewers and overcrowded slums, the local degenerates breed these creatures and pit them against each other in gladiatorial combat. Huge amounts of money changes hands daily on the outcome of these bouts. You are one of these breeders, and through hard work and unscrupulous tactics, you hope to find your fortune. This is the world of Underleague, designed by Fergus Blair and published by Cogwright Games. 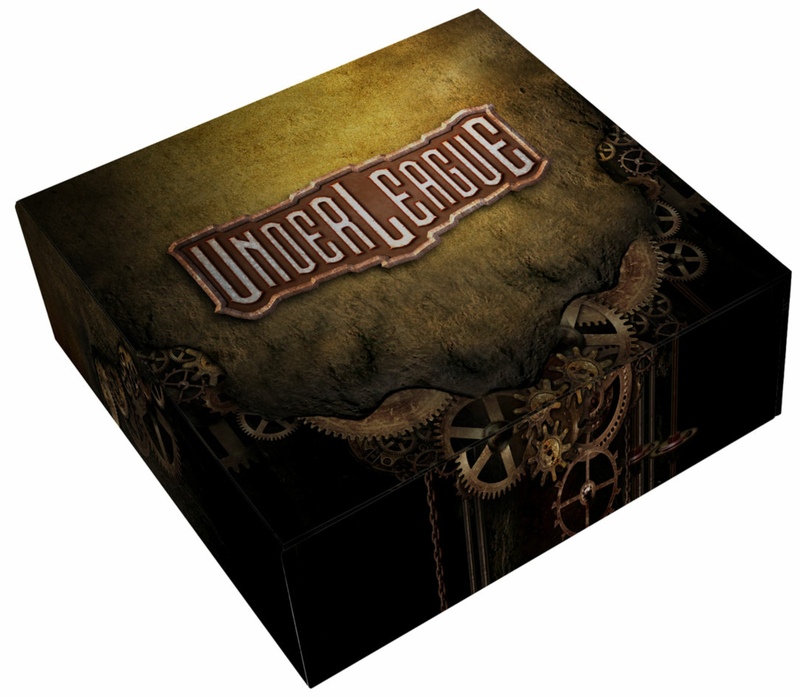 Underleague is a strategic card game for 2-5 players that plays in 45-90 minutes. Players will take on the role of collectors of fantastical creatures who pit these beasts against one another in illegal underground fights and gamble on the outcomes of these battles. Note: There are multiple ways to play Underleague. In this review, I will be focusing on the main game. However, there are rules for competitive play, as well as a draft format. I’ll leave it to you to learn these other methods of play. To setup a game of Underleague, shuffle the 250-card Strategy deck and place it in the center of the table along with the dice. Shuffle and give each player one of the 30-card Creature decks. These decks are identical to one another. Each player is also given a set of five betting chips. Players will then draw and look at the top three cards of their Creature deck and choose one card to place face-down in front of them. The other two cards are placed on the bottom of the Creature deck. Repeat this selection process until each player has three face-down Creatures in front of them. Players will then simultaneously reveal their selected Creatures. These Creatures will serve as the starting stable of beasts that will face off with one another in fierce battles for supremacy. The object of Underleague is to be the first player to reach 20 victory points. Your victory point total is made up of the value of your stable of creatures, modified by any equipment cards attached to them, plus the number of victory cards in your victory card pile. Underleague is played over a series of rounds, each round made up of three phases – the Pre-Season Phase, the Betting Phase, and the Combat Phase. At the beginning of the Pre-Season Phase, each player totals their victory points. If any player has 20 or more victory points, the game immediately ends and the person with the most points is the winner. If multiple players are tied, the tied player with the most cards in their hand wins. If there is still a tie, then the game ends in a draw. If no player has reached 20 victory points, the round proceeds as normal. Uncommit any committed Creatures (turning them from horizontally oriented to vertically oriented). Draw cards from the Strategy deck equal to the number of betting chips in their pool and add them to their hand. If they control three Creatures of the same type (beast, construct, or spirit), they draw an extra Strategy card. Collect any of their betting chips that are not currently in their pool, adding them back to their pool so they again have a total of five chips to bet with in the next phase. Choose to either invest in strategies (draw an additional two cards from the Strategy deck) or transfer a creature (replace a face-up creature with one from their Creature deck, discarding any equipment on the replaced creature, by looking at the top three cards of their deck and choosing one to add to the stable). Play proceeds around the table until each player has taken a turn during the Pre-Season Phase. Starting with the first player and proceeding around the table clockwise, players will take turns betting on which creatures they believe will win or lose during the upcoming Combat phase. To bet, simply take one of your betting chips and place it on any creature in play with either the Win or Lose side of the chip facing up. Players will bet, one chip at a time, until each player has placed all five of their betting chips on creatures on the table. The only restriction to betting is that you cannot place more than one of your betting chips on the same creature; all five of your chips must be on five separate creatures. Starting with the first player, each player takes a combat turn. During each of your combat turns you can make up to one challenge and play up to one strategy card. These actions are not required. You may do one, both, or neither. Although you may only make one challenge during your combat turn, there is no limit to the number of combat turns you can take during the Combat Phase. The Combat Phase only ends once an entire circuit around the table is completed with all players choosing to not make a challenge or play a Strategy card (or being unable to do so). To make a challenge, you will select one of your uncommitted creatures and commit it (turn it sideways, much like “tapping” in Magic: The Gathering). This creature is your attacking creature. Then select any uncommitted creature in an opponent’s stable. This is the defending creature. The defending player will then choose Day or Night. Each player takes a number of dice equal to the their creature’s Day or Night power (depending on the type of fight chosen by the defending player). If a player is rolling one die, use the D6. If rolling two dice, use the D6 and the D4. If rolling three dice, use the D6, the D4, and the D3. Each player will roll their dice. The total of the numbers rolled on the dice represents their creature’s combat total. If they are entitled to any re-rolls, each player will declare which dice they will re-roll (beginning with the attacking player). All re-rolls are taken simultaneously and each die can only be re-rolled once per combat. The creature with the highest combat power is declared the winner. If tied, the defending creature wins. Any effects based on the creatures winning or losing are triggered, beginning with the active player. If the attacking player wins, they take a victory card by drawing a card from the top of the Strategy deck and – without looking at it – and placing it face-down on their victory card pile. Any players who bet that the winning creature would win or the defending creature would lose will remove their chips from the creatures and return these chips to their pool. The defending creature is then committed. If the defending player wins, no player takes a victory card. Any players who bet that the defending creature would win or the attacking creature would lose will remove their betting chips from the creatures and return them to their pool. You can only play one Strategy card from your hand – either an Equipment card or a Scheme card – one each of your combat turns. You can play an Equipment card either before making a challenge, or after a challenge has been resolved. Scheme cards may be played at any time (unless otherwise noted on the Scheme card itself). To play a Strategy card, you must pay its cost. Each Strategy card has a cost associated with it. To pay the cost, you will discard that number of other Strategy cards from your hand. Equipment cards must be attached to a creature as you play it. It takes effect immediately and is attached to the creature on which it is played. 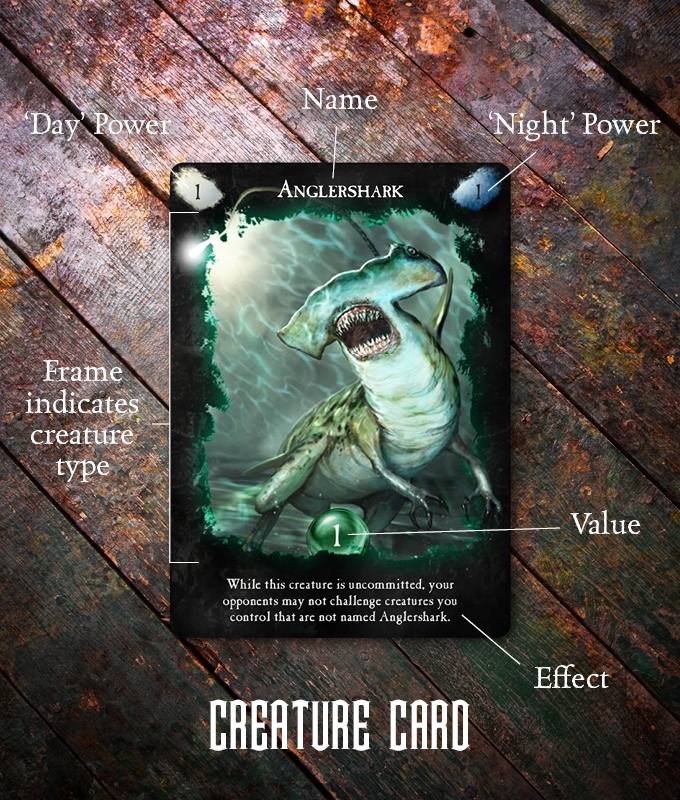 Note that Equipment cards have value modifiers on them which affect the total value of the creatures they are played on. These modifiers must be taken into account when totaling your victory points at the beginning of the Pre-Season Phase. Once you have taken your combat turn (making a challenge and/or playing a Strategy card), the player to your left takes their combat turn. Play will continue in this manner until an entire loop goes around the table with all players passing. Once this happens, the Pre-Season Phase immediately begins. Underleague is a fun, strategic creature battling game – where the focus of the creature battles is not on the fight itself, but rather on the betting. This provides a unique twist to the genre of games filled with monsters fighting to the death. 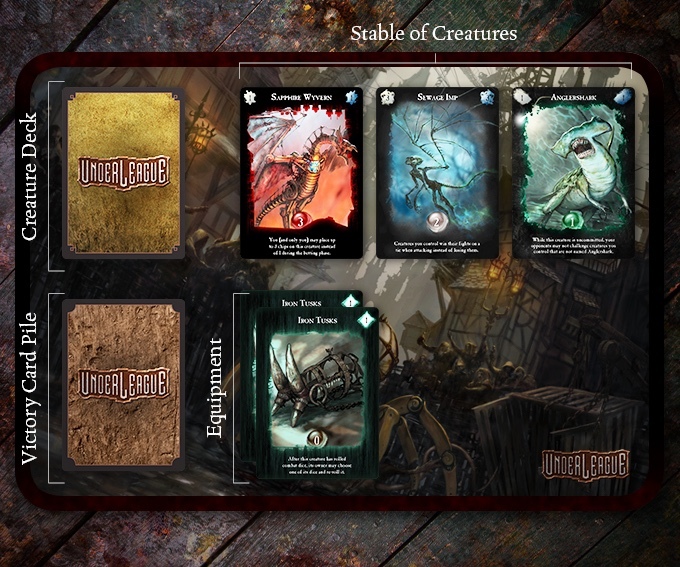 Underleague is going to draw comparisons to the granddaddy of creature-battling games, Magic: The Gathering. I don’t think this comparison is fair, however, because it is a VERY different game. In Underleague, your creatures are never killed. They are simply committed (exhausted) and will “revive” to fight again in the next Combat Phase (unless you yourself choose to switch them out). Also, in other monster-fighting games, you always want your creatures to win. In Underleague, your creatures losing is not necessarily a bad thing – as long as you bet on your own creatures to lose. This adds a level of strategy not previously seen in other card games of this type. The more bets you win, the more cards you will be able to add to your hand for use in future rounds. I really enjoy this aspect of the game. It goes without saying – though I’m going to say it anyway – that the art is absolutely stunning. The art is done by Mozchops (Paul Pippen), who previously worked on projects such as Warhammer, Batman and Fantastic Four comics, Spongebob Squarepants and Jimmy Neutron: Boy Genius cartoons, as well as designer the radio-controlled car racing hit Re-Volt. Mozchops does a great job of capturing the intensity behind each of these creatures, as well as the world of Helgarten itself. If you’ve not already done so, click the images in this post to see full resolution versions of them so you can enjoy the artwork. If I have one thing that falls in the negative column for me, it is the straight die rolls to resolve combat. I really would have liked to have sen a different combat resolution mechanism, preferably something not as random as rolling dice. I feel like the die rolls almost eliminate the strategy side of the game. No matter how well you’ve planned your turn and your bets, it comes down to the dice landing in your favor. That being said, I still enjoy the game because of the uniqueness of the Betting Phase. I would recommend taking a look at the Kickstarter campaign for Underleague and consider backing it. At the moment of this posting, there are about two weeks left in the campaign. Please feel free to ask questions below and I will answer them to the best of my ability. The Dice Tower Network is proud to announce the nominees for the best games of 2016. A jury of more than seventy Dice Tower staff, prominent bloggers and reviewers went through all the games released in English in 2016, and chose the five best in each category – with ten games nominated for best game of the year. 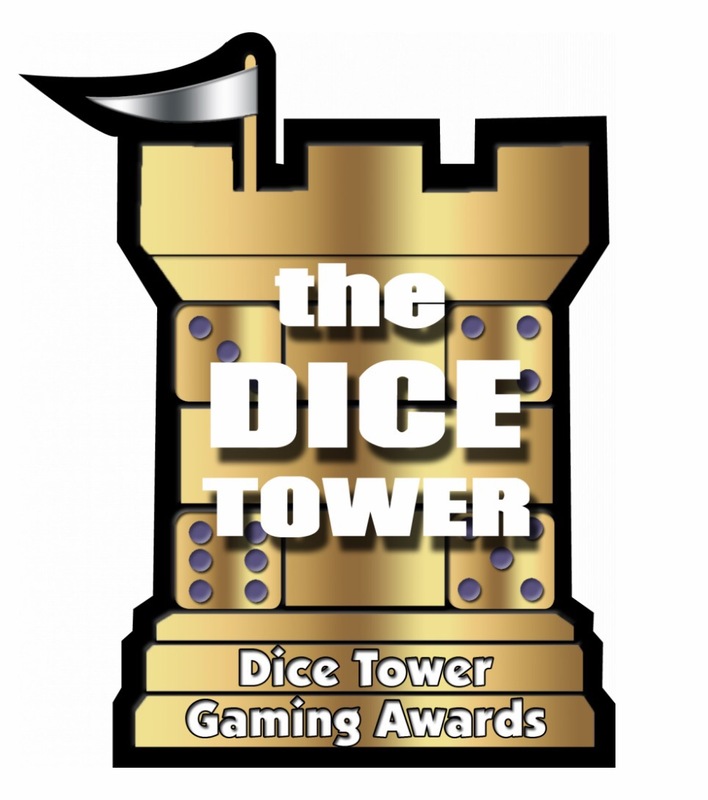 The winners of each category will be announced at the Dice Tower Convention in Orlando, Florida. Congratulations to all the publishers and designers who were nominated, and we hope that gamers will have a list of truly excellent games to seek out and play. Note: The game has to be the designer’s first or second published game to qualify for this award. Note: The publisher must have published five or fewer games at the beginning of 2015. There are riches to be found in them hills! Grab your pickaxe, miner hat, and trusty pooch and get ready to dig up copious amounts of copper, silver, and gold. Ma Courtland and Baron Pearce are counting on you to fullfill your contracts and prove yourself to be the best miner in the land. 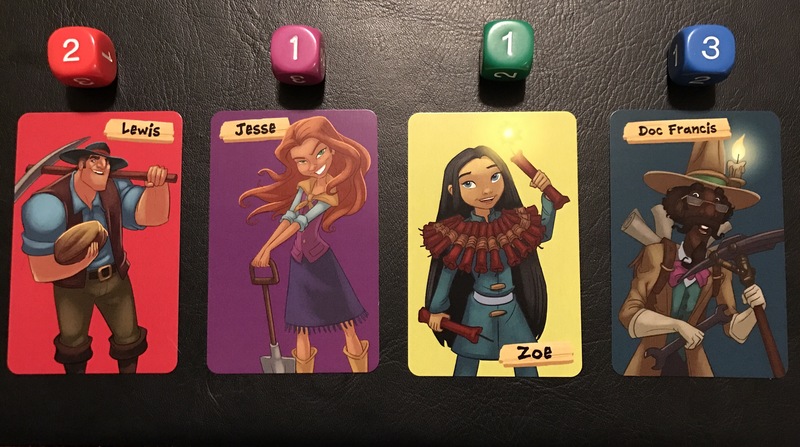 Today, we take a look at Ore-Some, designed by Sarah Kennington and published by One Free Elephant, which will begin its Kickstarter campaign on February 14! To set up a game of Ore-Some, randomly determine who will be the first player and give them the first player marker. Each player will then choose a character card and take the mine cart of the corresponding color. The next thing to do is set up the game board. This is done using the stack of tiles, which ensures that each game of Ore-Some will always be different than the last. Begin by placing the mine shaft tile as the center tile. Then, place each of the colored corner tiles in the four corners of the board. Give each player a colored tile (but not their own color), and use the remaining tiles to form the tile stack. Beginning with the first player, each player will add tiles to the mine by either drawing a tile from the tile stack or using the colored tile they were given. This tile is added to the mine by connecting it with one of the tiles already placed. Tiles may be rotated in any configuration the player chooses, as long as the tracks on adjacent tiles line up (a track going off the edge of the board is acceptable). If the drawn tile cannot be placed, it is discarded and a new tile drawn and placed. This will continue until a 5×5 grid is complete. This grid will serve as the mine for the duration of the game. If any of the colored tiles have not yet been placed when the 5×5 grid is completed, the player who chose the character matching the color of the unplaced tile(s) can remove any neutral tile and replace it with the tile of their color (ensuring that tracks still line up). All remaining tiles are returned to the box. Once the board is set up, each player will place their mine cart on the corner tile that matches their character color. Place the coins in a pile near the board within reach of all players. Do the same with the wooden beams. All of the colored wooden cubes (the ore) are placed inside the bag, and the bag is placed near the board. Shuffle the two decks of contract cards and deal one of each type of contract to each player. Players should keep these contracts hidden from the other players. The two contract decks are then placed near the board, with the Bank Price card placed between them. Place the Pocket Watch token (round marker) on the space marking round #1 on the Round Tracker card. Shuffle the Action Card deck and deal three action cards to each player (these cards are also kept secret by the players). Place the remaining Action Cards facedown to form a draw pile near the board. Make sure Scraps is close to the draw pile. Ma Cortland (white) and Baron Pearce (yellow) will begin on the mineshaft (center) tile of the board. Finally, give each player a reference card and a die matching their color. Ore-Some is played over 6 rounds, with each round being made up of two phases – a move phase and a dig phase. Let’s break each phase down. 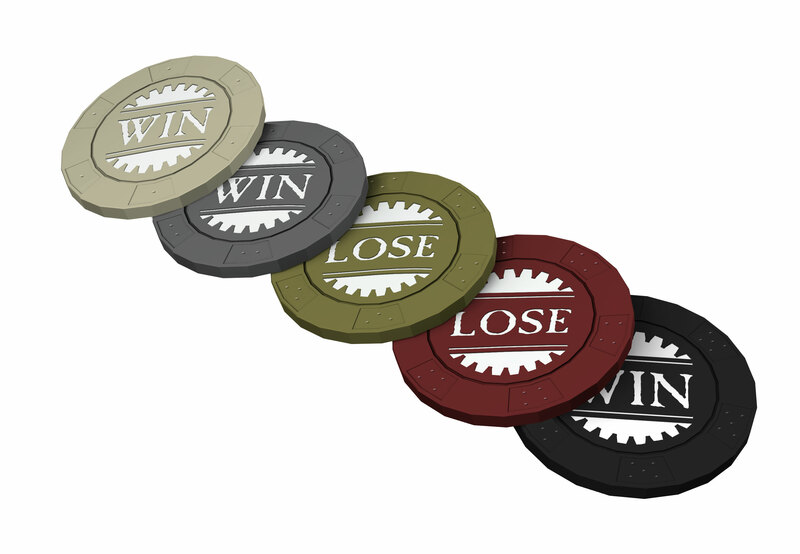 Once the Contract Agents have been moved, all players will simultaneously roll their die to determine the number of moves they will have on their turn. It is important that all players roll simultaneously because players have action cards that can be played to affect either their own movement or the movement of an opponent. The first player will then complete the remainder of his or her move phase by playing action cards to improve their own movement (or affect an opponent’s movement) and then moving their mine cart according to their die roll (plus or minus the result of any action cards played). When moving, they must always follow the track they are on and cannot switch directions mid-move. If the track were to go off of the board, their cart is shunted and they drop a piece of ore out of their cart. Shunting also occurs if they collide with a wooden beam blocking the track they are on, or if they collide with another player’s cart. Once they have completed their movement, play will continue clockwise so each player can complete their move phase in the same manner. Once all players have completed their move phase, we move on to the dig phase. During the dig phase, each player will take up to three actions – dig for ore, cash in ore, and pick up ore – in any order they wish. Starting with the first player, each person will complete their entire dig phase and then play will proceed clockwise around the table. On their turn, each player MUST dig for ore. This is done by drawing two cubes out of the mine bag (or four cubes if your cart is on a tile that matches your color) and placing them into your mine cart. Any cubes that are dropped during this step remain on the tiles where they land. If any dropped cubes land off of the board, place them on the tile closest to where they landed. There can be multiple cubes on a single tile. The second action a player can take is to pick up ore. If there is any ore in the tile where the player’s cart is currently located, the player can opt to pick up any or all of it and place it into his or her mine cart. Any ore that is dropped during this action remains in the tile to attempt to be picked up again on a later turn. The third action that can be taken is to cash in ore. There are two ways that ore can be cashed in. Ore can be sold to the bank or it can be used to complete contracts with one of the Contract Agents. If sold to the bank, the sold ore is returned to the bag, and the player selling it will take money equal to its total value ($3 per gold, $2 per silver, $1 per copper). In order to complete a contract, the player must have the ore shown on the contract card AND be within four track tiles of the agent the contract belongs to (i.e. the agent shown on the card. 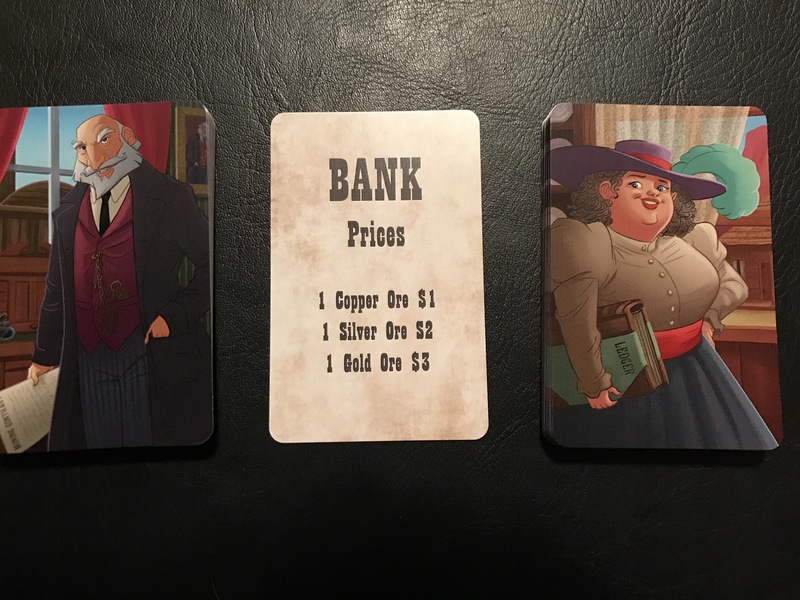 To cash in a contract, the player will lay the card (face-up) on the table and then remove the required ore from their cart and place it on top of the contract card (to show they have all of it). The ore used for the contract is returned to the bag, and the contract card is placed face down near the player who completed it and will used for scoring at the end of the game. Any remaining ore is returned to the player’s cart in any order they would like. Any ore dropped during this action does not count as dropped ore and can be picked up. Once all players have completed their dig phase, each player has the option to discard as many cards as they would like, and then draw back up to a hand of five cards. Their hand can be made up of any combination of contract and action cards. The round marker is advanced to the next round, the first player marker is given to the next player in clockwise order, and play resumes with the move phase. At the end of the sixth round, any ore not used to complete contracts is sold to the bank. Players count up the money earned through completed contracts and ore sold to the bank. The player with the most money is the winner. 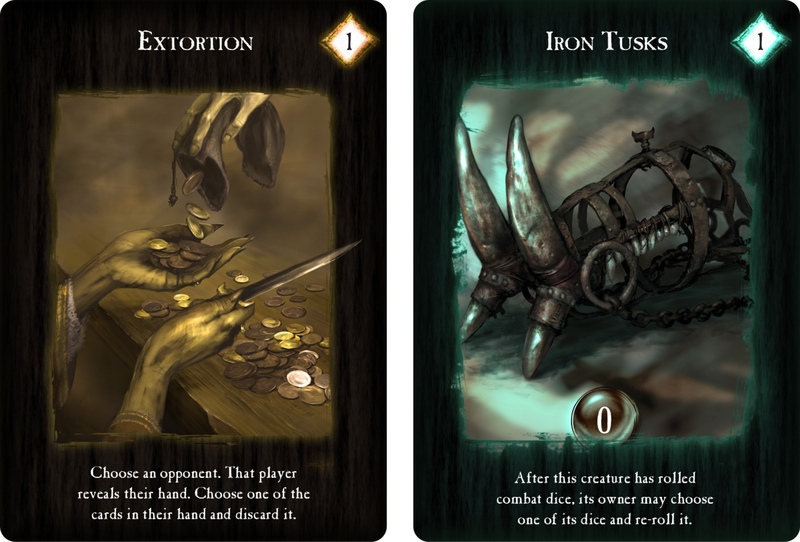 There are three types of action cards that can be played over the course of the game. There are Move cards, Dig cards, and Surprise cards. Move cards can be played during the Move phase of the game, and are identified with a railroad track icon on them. These cards are used to help mitigate your own die rolls, allowing you to move further (or not). You can also play Move cards against any of your opponents to slow them down (or speed them up). Dig cards can be played during the Dig phase, and are identified by a pickaxe icon on them. These cards allow you to draw extra ore, steal from other players, or place (or remove) wooden beams on tiles to block movement throughout the mine. Surprise cards can be played at any time, and are generally used to counter cards played against you (such as blocking an attempt to steal ore from you or making other cards inactive). These cards are easily identified by an exclamation point icon. I’m going to make this review about as simple as I possibly can …. Ore-Some is just plain fun! It’s a simple to teach and play game that is fantastic for families to play together. 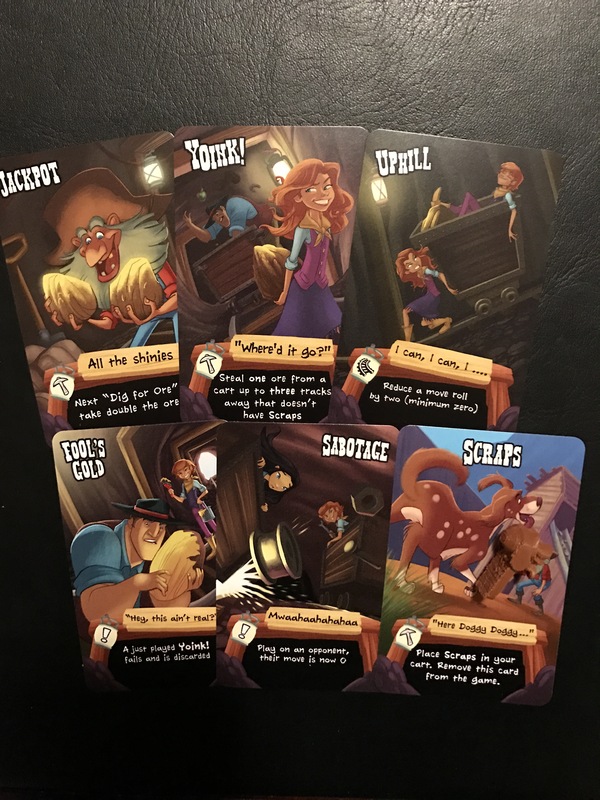 If you have younger kids (ages 8 and up would probably be best), and they’re like mine, they’re going to absolutely love the “take that!” of the cards. My kids love to steal things from my mine cart, or cause my cart to not be able to move by playing Sabotage cards to negate my die roll completely or Dynamite cards to throw wooden beams in my way. It definitely makes for some good laughs and they thoroughly enjoy playing this game whenever it hits the table. Their enjoyment simply adds to my own enjoyment of the game. 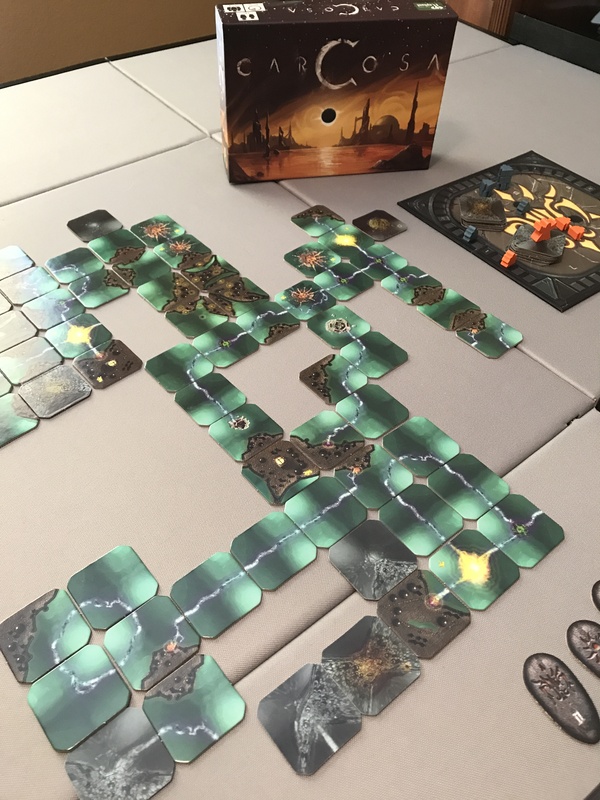 The mechanisms in Ore-Some are very solid, and the modular tiles that make up the game board help ensure that no two games are ever the same. Some players may find that playing only six rounds is not long enough. Good news! You can opt to play for eight rounds by simply flipping the Round Marker card to the other side! This is definitely a light filler game. While it won’t be a staple at your game nights, it makes for an excellent game for a family game night! 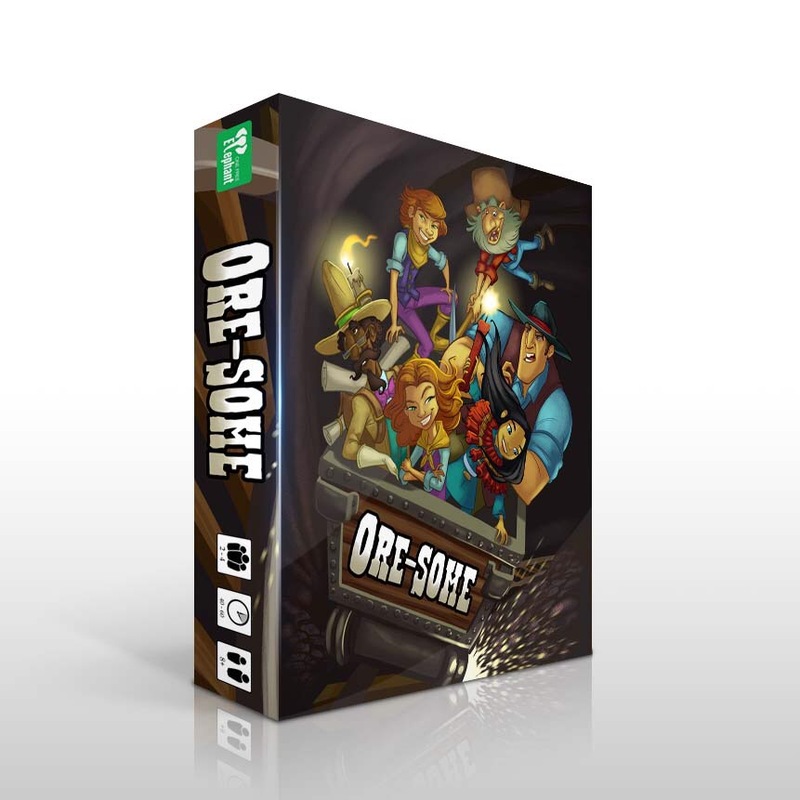 Head over to the Kickstarter page for Ore-Some for more information and to back this project. Today, I received my copy of Santorini, designed by Dr Gordon Howard and published by Roxley Games. Because I was so excited to get it in my hands, I just had to do an unboxing video for all of you. Check it out below and be sure to subscribe to the channel and leave your comments or questions.